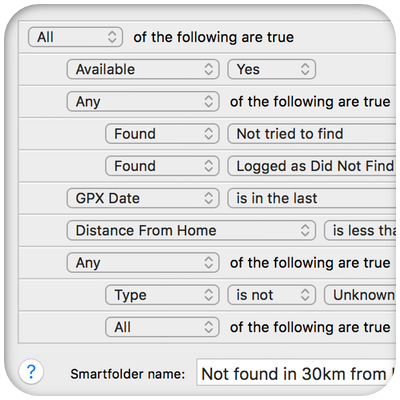 In the upper right corner there is a quick-searchfield to make textual searches, like you’re used to with Mac applications. 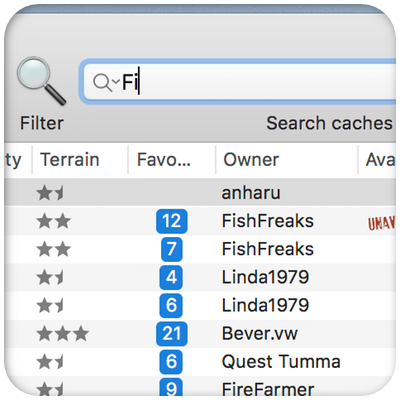 There is also an extended filter-dialog that gives you a way to make refined searches on multiple aspects of geocaches. You can nest several filters with ‘all of the filters’, ‘some of the filters’ and ‘none of the filters’ groups. You can easily rearrange filter rows by dragging them with your mouse. Save your filter as Smart Folder for later use. For instance to use a certain filter for export to your device.